Beginning around 1840 the Reform movement began asserting itself as a major force in American Judaism. Indeed, with the rising tide of Reform during the nineteenth century it looked as if Orthodox Judaism might disappear. Many synagogues that had been founded by observant Jews and had remained for years true to halacha found their memberships increasingly calling for the institution of reforms and the abandonment of commitment to authentic Judaism. There were courageous Jewish spiritual leaders who did their utmost to resist these trends. Even though they were not ordained rabbis and were addressed with the title “Reverend,” they exerted strong Orthodox spiritual leadership. To name just a few, this list includes Isaac Leeser (The Jewish Press, June 22, 2007), Jacques Judah Lyons (The Jewish Press, September 3, 2010), Abraham de Sola (The Jewish Press, December 3, 2010), Arnold Fischel (The Jewish Press, February 3, 2012), Samuel Myer Isaacs (The Jewish Press, August 3, 2012 and September 7, 2012) and Sabato Morais (The Jewish Press, March 1, 2013 and April 5, 2013). Another such individual is Henry (Chaim) Pereira Mendes (1852-1937). “Zechuth aboth, the ancestral merit which is the spiritual capital of the Jewish people, may be said to have predestined Henry Pereira Mendes to the rabbinate from his birth. Through both his father’s and his mother’s lines, the rabbinate was the outstanding characteristic of his family tradition. At the time that he was born, April 13th, 1852, in Birmingham, England, three members of his family were ministering in synagogues: his father, his grandfather and his uncle. His father, Abraham Pereira Mendes, was minister of the Jewish congregation in Birmingham. His grandfather, David Aaron de Sola, translator of the Sephardic and Ashkenazic prayer books, author of numerous learned works in English, Hebrew, German and Dutch, and the first preacher in English among the Sephardim of England, was the hazan and preacher of the Spanish and Portuguese Synagogue in London, while his uncle, Abraham de Sola, Professor of Hebrew and of Spanish literature at McGill University, was minister of the Sephardic community in Montreal. A little later another uncle, Samuel de Sola, became hazan of the Spanish and Portuguese Synagogue in London. Beginning at age 12 Henry attended Northwick College in London, a school founded and directed by his father. On the night of his bar mitzvah he decided he wanted to spend his life serving Judaism in the capacity of a spiritual leader. He attended University College in London from 1870 to 1872 while at the same time continuing his religious studies with his father and the Reverend H. L. Harris. 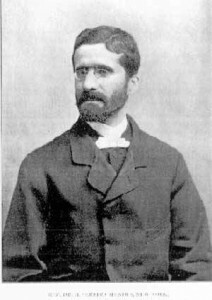 From 1875 to 1877 Reverend Pereira Mendes served as the spiritual leader of the Sephardic Congregation in Manchester, England. “On January 16, 1877, while he was still ministering in Manchester, the board of trustees of Congregation Shearith Israel in New York decided to invite him to visit New York in connection with the vacant position of preacher in their congregation. He accepted, and on May 30 of that year, when barely twenty-five years of age, he was elected interim preacher until the meeting of the electors of the congregation in the following autumn confirmed the appointment. On October 15, 1890, Henry married Rosalie Rebecca Piza, daughter of Samuel and Rachel Piza of St. Thomas, Danish West Indies. Mrs. Pereira Mendes was known for her social grace and ceaseless spiritual striving. In his capacity as spiritual leader of Congregation Shearith Israel, Reverend Mendes conducted classes and gave lectures on a wide range of topics including Bible, Jewish history, Hebrew, Jewish literature, and other topics related to Judaism. This teaching, infused with inspiration and compassion, reflected his broad intellectual abilities. “It is impossible to record the untiring affectionate personal service which Dr. Mendes at all times gave to the members of his congregation in joy and in sorrow. His tenderness of nature, vivid sympathy, deep spirituality and firm faith, made him an inspiration to the bride and bridegroom under the canopy, and a stay of strength to those stricken by bereavement. He was a spiritual father to two generations in his congregation. However occupied or weary he might be, no call ever found him other than ready to respond. In his life he exemplified the religious ideals which week by week he voiced from the pulpit. He never accepted for himself fees or emoluments for services which he rendered. At first he would return such gifts, but later he adopted the practice of accepting them for charitable distribution. “As preacher, he maintained the highest standard, never stooping to sensationalism, nor lowering the loftiness of Jewish teaching in order to gain an easy popularity. “Gifted with a clear and ringing voice of unusually sympathetic quality, a chaste precision of diction, and a rich and poetic vocabulary, his emotional and hortatory messages rose to the heights of true oratory. This, together with the transparent sincerity of the man behind the word, gave to his public speaking a moving power which has charged unnumbered lives with beauty, strength and idealism. The Bible which he loved so well was the constant source of his inspiration. It lived in his life, and he made it live in the life of his auditors. It touched him with the divine fire of the prophets. To him it spoke in the clear illuminating tones of ‘Thus saith the Lord.’ In its pages he found the message of the word of God. Its themes on which he loved to dwell were idealism, the three R’s of Reverence, Righteousness and Responsibility, peace, prayer, and, always, God. Reverend Pereira Mendes’s activities were not confined to his role as chazzan and preacher at Shearith Israel. Next month’s column will deal with some of his myriad activities on behalf of the Jewish community in America. About the Author: Dr. Yitzchok Levine served as a professor in the Department of Mathematical Sciences at Stevens Institute of Technology, Hoboken, New Jersey before retiring in 2008. He now teaches as an adjunct at Stevens. Glimpses Into American Jewish History appears the first week of each month. Dr. Levine can be contacted at llevine@stevens.edu.